SoundCloud is a free online application for sharing your musical creations with entire world with an extremely easy-to-use interface and rich community options. 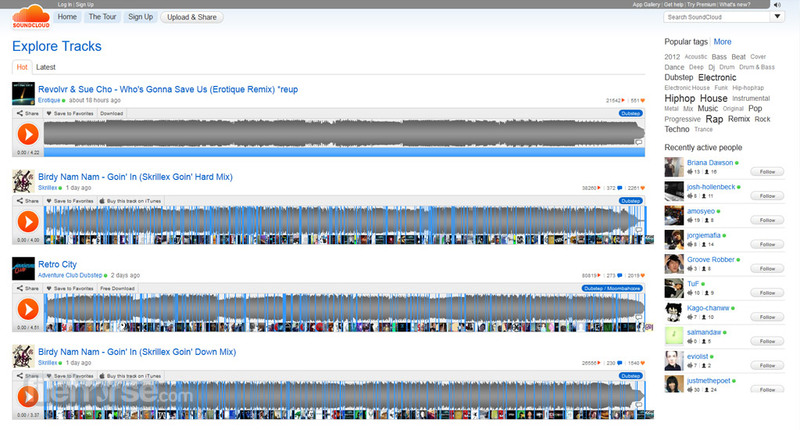 All tracks you upload will be nicely presented in your profile, and perfectly playable from any popular browser on today’s market. One community feature that separates SoundCloud from the competition is the ability of community to comment not only your entire songs, but also to leave their remarks on specific points in your compositions. If you are aspiring artist in need of a easy and fast way to showcase your creations, then SoundCloud is a perfect site for you. The easiest way to share music online! Musicians, DJs, classically trained performers, podcasters and many other creators from all around the world have always strived to find one online service that can fill all their need – give them a secure place where they can upload and share their musical or audio pieces, offer great UI and community tools to anyone who comes to listen to their work, and enable easy sharing so that music can be heard on all four corners of the web and the world with few simple clicks of your mouse. This all was brought to them by SoundCloud, innovative online audio distribution platform. Founded in Germany in 2008, this extremely successful service manages to completely challenge and destroy the dominance of MySpace as the premier music-oriented social network and sharing platform in the world. As one of the most popular music sharing websites of all time, SoundCloud manages to bring listeners and music creators together like no other online service has managed before. SoundCloud is one of the most popular online audio distribution platforms on the market, created from the ground up to enable not only easy way users can upload and share their musical creations. It is also a stepping stone on creating a vibrant online community that can listen to your songs not only via SoundCloud platform that is currently visited by largest gathering of artists, bands, podcasters and music creators in the world, but also via countless other web applications that haveelected to take advantage of the powerful SoundCloud API and integrate its musical library of countless million songs into their projects. Today, SoundCloud is regularly visited by over 40 million registered users and 200 million monthly listeners, which makes this site one of the 200 most visited websites in the world, and without a doubt one of the top music oriented online destinations that you can find. With SoundCloud you can easily upload your musical creations, manage community that visit your profile page, create and join groups where content from several artists can be easily accessed and listened, share your songs using distinctive URLs, and if you want embed your songs in every website in the world (which is a feature that many music sharing community sites don’t want you to have). Orange and white theme and embeddable audio player that features visualized waveform of the song has become a synonym of SoundCloud, easily found in every corner of the internet – from personal websites, blogs, forums, comment sections, social networks and more. Orange and white interface of SoundCloud is great for discovering new music, tracking favorite artist, and creating your own online library of unique content. All the UI navigational tools, search and sharing options are easily accessible and fast. The easiest way to share music online! 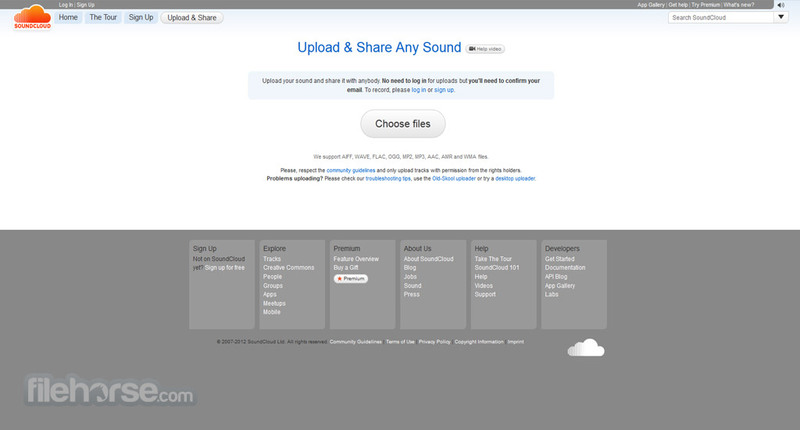 Basic features of SoundCloud are free for everyone, including uploading, discovering, listening and sharing of music. If you are more serious user that demands, like the ability to post really long musical pieces (up to 4 hours of length), get more promotion options, great analytics suite, and better community management options. All this bonus features are a part of Pro plan that costs 29€ per year. If even that is not enough for you, Pro Unlimited has even less restrictions for 9€ per month. 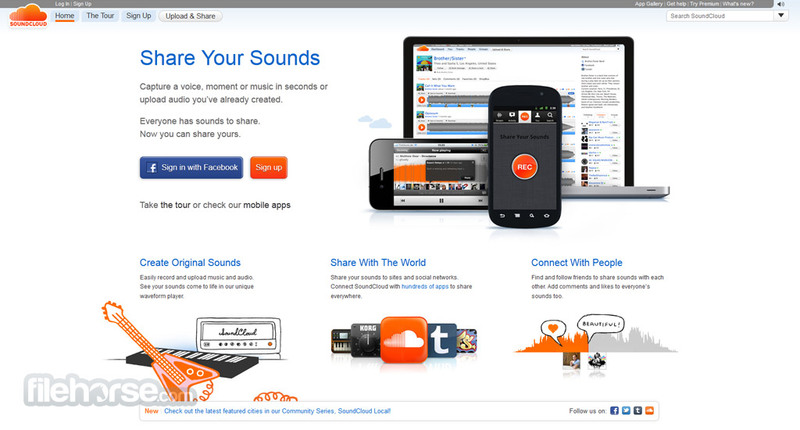 If you are music creator, chances are you already know about SoundCloud and how awesome its feature and popularity are. If you are just a listener who wants to discover new music, visit SoundCloud right now and you will never leave. Whether it's a quick sketch or a polished symphony, upload or record your originally-created sounds effortlessly to SoundCloud in a few clicks. Cloud Server will deal with pretty much any audio format so you don't have to worry about that. See the shape of your sounds with the unique SoundCloud waveform player that visualizes your sounds and makes them good looking and playable too. Now your sounds are ready to get truly social. Timed comments let your friends and fans give you valuable feedback at specific moments throughout the waveform. Pinpoint exactly what's working well and start a conversation around it. The easiest way to share music online! See all the fresh activity on your tracks and hear new sounds from the people that you follow right in your Dashboard - your daily inbox of sounds. Find, create and share in thousands of groups covering every style or sound. Find people to collaborate with or collect audio submission with a group DropBox. SoundCloud makes it easy to share and promote your sounds to anyone, anywhere by connecting your account with Twitter, Facebook & other neat services. Embed your sounds in one of three stylish SoundCloud widgets and take them anywhere - your blogs, profiles or websites. Bring your sounds to your listeners, not the other way round. Get back some serious feedback and insight on your sounds. Whether you’re a pro musician or a casual creator, you only need to check one place to see who’s enjoying your sounds.